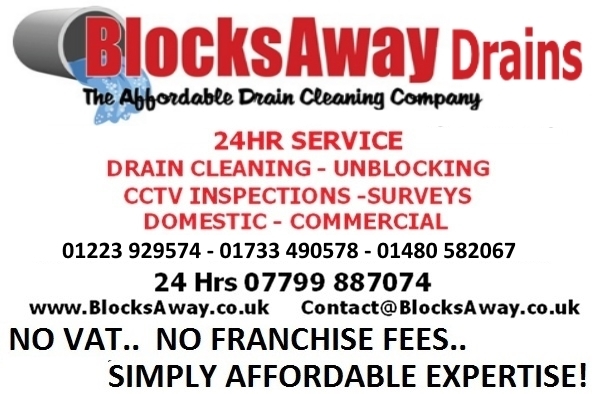 Blocksaway Drains, the affordable Cambridgeshire drainage experts, improving the image of the drain services industry, by providing best value, courteous and prompt drain clearing, cleaning, unblocking and CCTV inspection services in Cambridge, Peterborough, Huntingdon and surrounding areas. Blocksaway Drains does not seek to make exorbitant profit from our customers; our staff are not incentivised to maximise the value of the work they undertake, but simply to achieve absolute customer satisfaction above all else. There are no hidden additional costs such as “call-out” fees, VAT or extra charges for unsocial hours or the use of special equipment (we carry the full range all the time). *for the first hour, sufficient time to resolve most domestic and office drainage problems. Click on PRICING from the menu above to see further details.